Mahogany easels in your choice of an Auburn, Dark Mocha or Light Mocha stain; all with a satin finish. 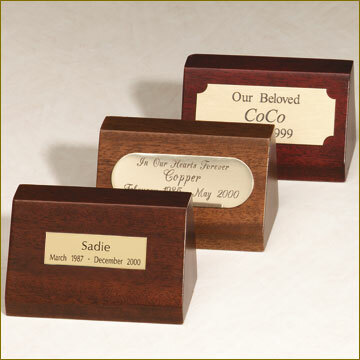 Makes a perfect alternative when choosing an urn that does not accommodate appliques, plates or surface engraving. Choose from the included Notched Rectangle Brass Plate, Oval Brass Plate or Large Standard Rectangle Brass Plate for personalization. Plate attaches to the wooden easel with self-adhesive material. Wooden Easel is 3.5"W x 1.75"D x 2"H.
Which Brass Plate would you prefer?